So, what do you think I recycled to make this project? Yep, a flattened toilet paper tube! Cool right? This was for another swap on Swap-Bot. I joined a group called Somerset swappers that uses Somerset brand magazines as inspiration for all swaps. In case you aren’t familiar, these magazines feature different hand made items from recycled projects to doll art to shabby chic deliciousness to vintage items to aprons to whimsical artsy altered projects. The design is pretty basic. 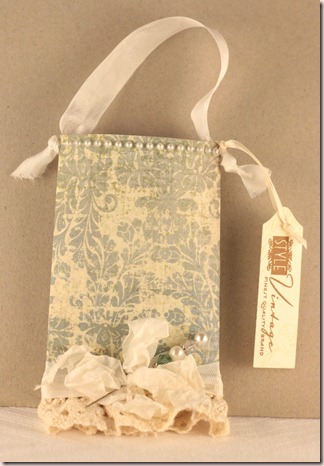 The outside is wrapped with patterned paper held on with adhesive and the bottom is stapled closed. I also held the lace on with staples and covered them with the scrunched seam binding. I tried something new with this ribbon. Sharon (I can’t remember if it was Harnist or Johnson, oops, sorry) had on her blog that she ties the ribbon, then spritzes and scrunches it. I tried that because I wanted flat ribbon around the tube to better hide the top of the lace and the staples but a scrunched bow. Worked out very well! I used gold Perfect Pearls Mist that I made and spritzed the whole project. TIP: I don’t use hat pins much anymore for beading because it is too expensive. Instead I use corsage pins or head pins made for jewelry. The head pins are best in some ways because almost any bead fits on the smaller ones, even those with small holes but they bend too easily and you have to work them into the bow rather than stab them right through the middle of the knot because they are blunt tipped. The corsage pins have thicker metal so fine-holed beads don’t work but they are sharp tipped. Paper: My Mind’s Eye, vanilla CS-SU! How pretty you have made a toilet paper roll! Great job.